Not a long ago I started playing Payday 2 with my friends. 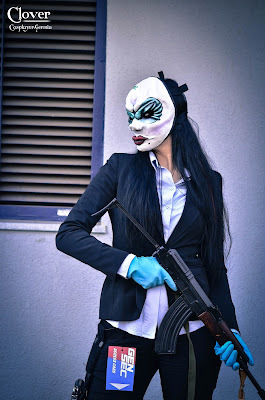 I played Payday:The Heist before, but wasn't so excited about this prequel as much asi I am now with sequel. I started to play Payday 2 with guys, which are enjoying the game a lot, finding new ways of accomplishing the heists and are interested in lore of this game and I simply love to play it with them. One of the ways how to render a tribute to this game I fell in love with, is to honor it with cosplay. And as Clover was one of the first characters I've played in this game and I feel like she's that kind of a girl I like - rough, strong, can compete with guys - she simply fitted to me, I decided to make a cosplay of hers. I will start with the most difficult part of this costume. I have tried 3 different ways how to make a mask without having a cast of your head: aluminium foil with tape and papiermache, paper strips with tape, papiermache and acrylic cement and worbla (thermoplastic material) with ceraplast (self-drying modelling clay) and acrylic cement. The third one was the most expensive (worbla costs a fortune), but the fastest, easiest and the most functional way for me. So I used a heating gun to soften the worbla and shaped it right on my face. It hardens really fast and careful, it's really hot! 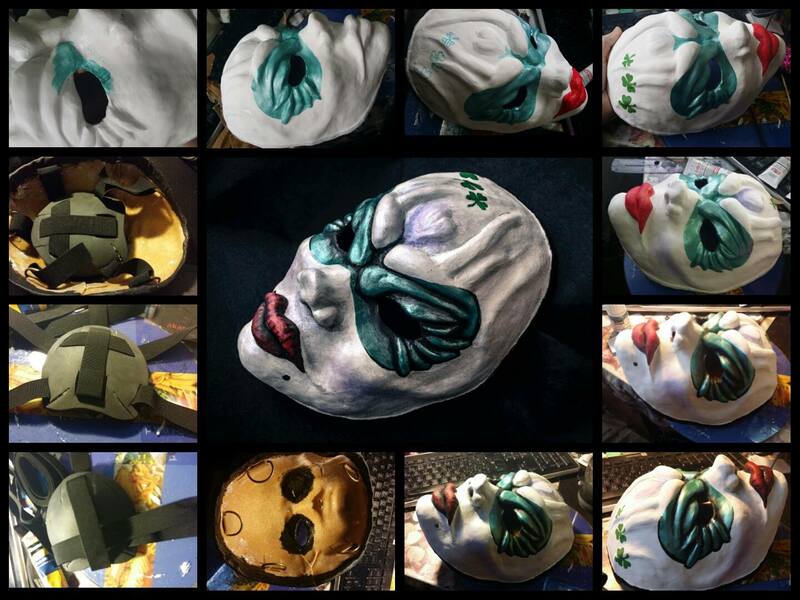 Then I´ve used modelling clay to make the shapes of the clover mask. I used the game itself as a referrence by making it (Choose the mask and push preview button). Then I let it dry for a day. I made the border of the mask from worbla too. 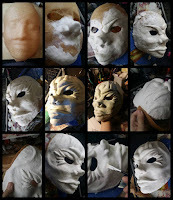 Then I´ve soften the shapes with acrylic cement and sanding paper. Then it was time to color this mask. I´ve used acrylic colors, that you can mix with water, but after drying, they're water-resistant. I've chosen green and blue pearlescent color for the eyes, purple pearlescent for the shades on the cheeks and forehead, solid green for shamrocks, red for lips, black for shades and borders and transparent pearlescent for the whole mask. You can seal the colors with acrylic laque. 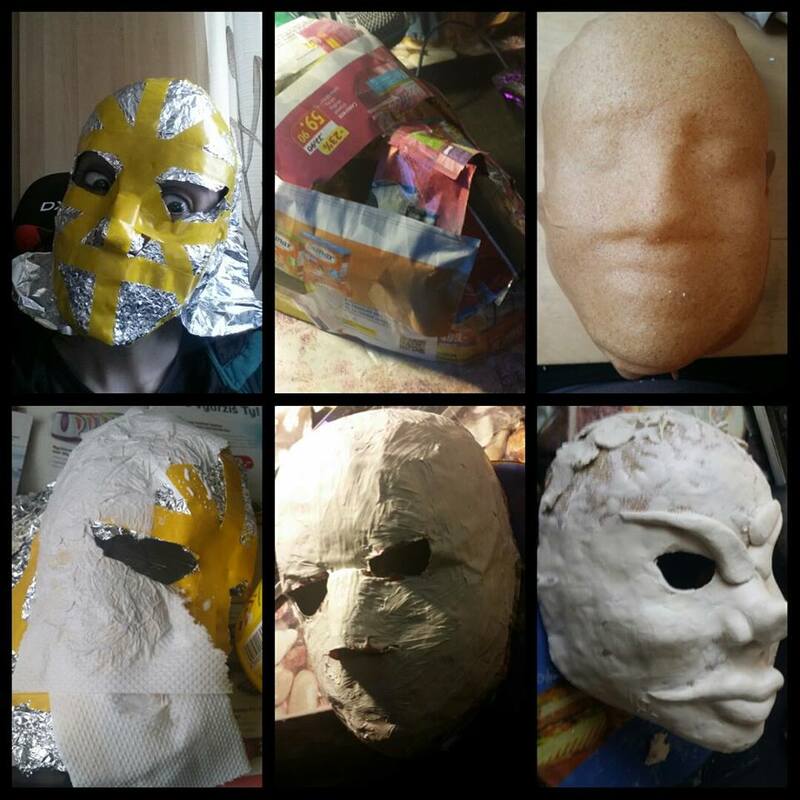 Last step was to make this mask hold on my face.Worbla can stick to itself, so I made holders from worbla, metal buckles and black rubber straps, that comes into a small backhead part from grey EVA foam. What are the above mentioned materials and where can I buy them? Worbla - brown thermoplastic material in sheets. Heat gun - gun-shaped electric tool making heat. 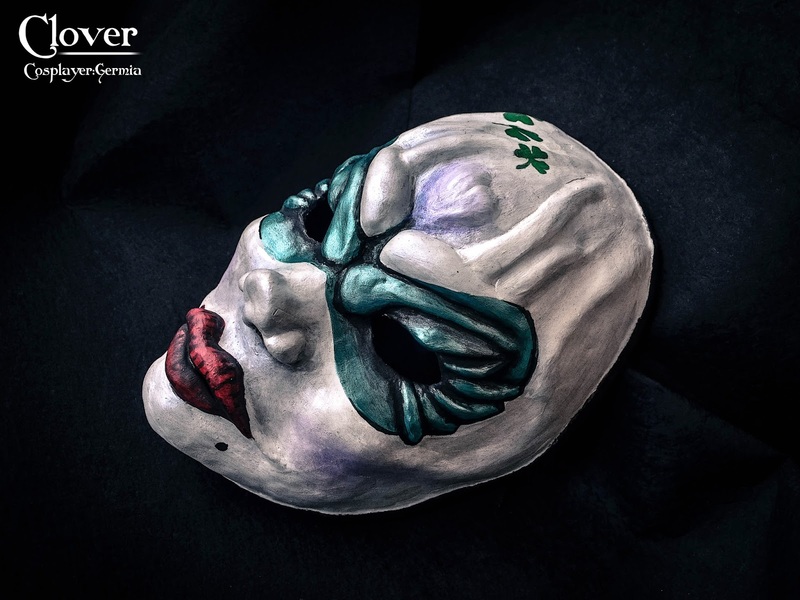 EVA foam - thicker craft-foam with high density, can be glued with chemoprene glue. Acrylic colors - after drying, water-resistant colors. If you're not interested in making the mask of your own, you can buy some masks in some stores as Payday 2 merchandise products. 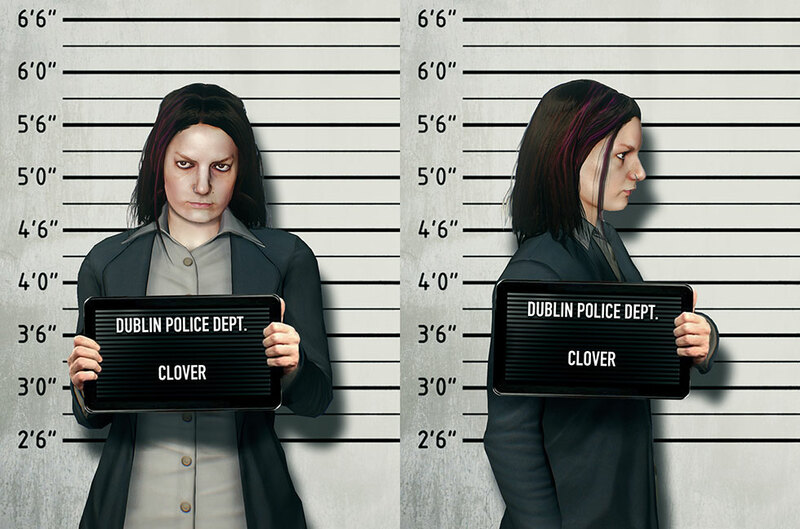 But I don't think Clover's mask is available too. 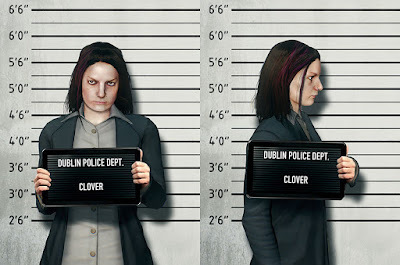 The clothes of Clover is quite simple. You need a suit. so a black blazer and matching black trousers. Underneath you have a white (or light blue) shirt with buttons. I think this clothes is quite simple to buy and there is no need to sew it. If you don' t have enough funds, you can try to find it in second hand shops. The shoes are simple black ones too. To make an accurate cosplay, you need to pay attention to the details. On this cosplay, it' s the pink lock of hair, small piercing in the nose and blue gloves. Optional equipment are GenSec keycard, weapons (ideally the ones from Clover DLC pack), gun pouches. Silver small piercing - you can either pierce your nose or make a false piercing from a piece of wire like I did. GenSec card - I´ve downloaded a picture from internet, printed it out and sealed that in transparent foil. 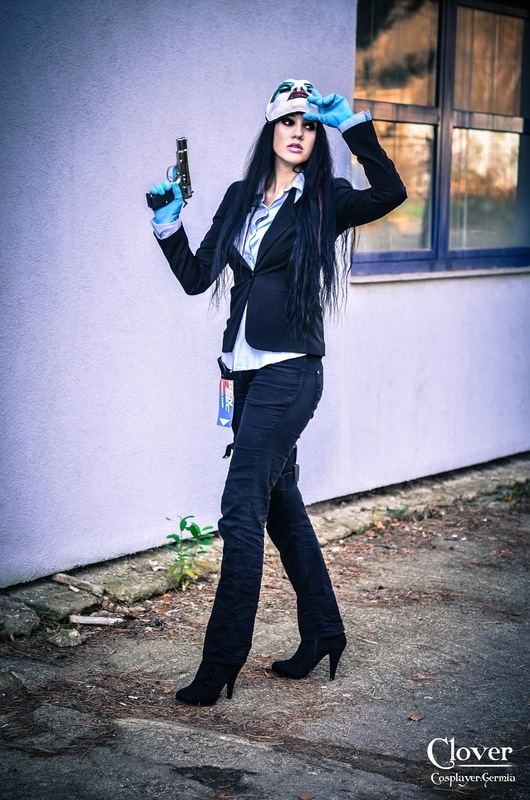 - Simple, casual and comfortable cosplay (a lot of costumes aren't very comfortable to wear). - There are not many cosplayers of Payday 2 secondary character, so it's kinda original. - Storable cosplay - the transportation and storing of this cosplay is really easy. - I have same hair and eyes color with the character, so I don't have to wear contact lenses and wig. - Your weapons can attract unnecessary attention on action. - You actually look like a robber. - Your cosplay is simple and doesn't show your skill as other cosplays could. 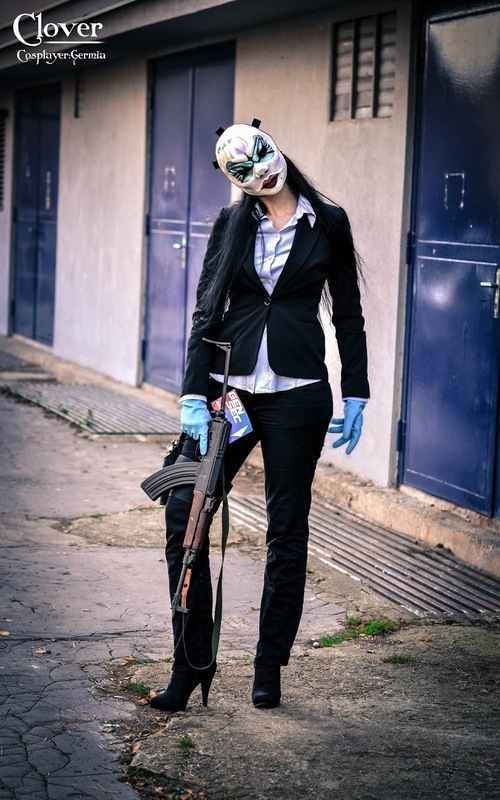 - Payday 2 is not as mainstream as for example Diablo 3, so it could be for some gamers difficult to recognize your cosplay. - Some people can evaluate your cosplay as awful - in fact you're cosplaying a bad guy with horrifying mask.